Time to Talk Day 7 February. This year the theme is having the right ingredients, to have a conversation about mental health. This could be from having a private chat over a cup of tea to hosting an open event where strangers can get together and share their experiences. Whether it’s private or public it’s all about creating a comfortable, non-judgemental environment where anyone and everyone can feel safe to talk about mental health whether it is their own or someone they know. Despite all the work being done to eliminate the stigma surrounding mental health there are still communities that do not understand mental health and see it as an illness that will go away with some tablets, it is a punishment that can be treated by praying more or by carrying out particular rituals. Those in the Asian community living with a mental health illness may keep this a secret from their family, friends because of the stigma still associated with mental health and the fear of being ostracised. Then there is the fear of what society will say if they found out, what they will say about the parents, who will marry them. My own brother has Asperger’s, our own parents didn’t really understand what this meant and what it meant for my brother. It wasn’t something anyone in their family has come across before, this it isn’t because no one else had been diagnosed with autism but because it isn’t something that is recognised or acknowledged. In there minds there was nothing wrong, which in some ways is a good thing because my brother is capable of doing many things but his normal is not the same normal for everyone one else. I don’t want readers to think that families / friends don’t care but to understand that this isn’t a community that wouldn’t come together. No one should have to hide how they feel but it isn’t easy to break the mould, to go against cultural thinking and traditions that have been ingrained from childhood. Culture has a way of adapting without breaking traditions. For many people religion is part of their identity who may feel that being mentally unwell could compromise that relationship it can make seeking help and starting the recovery journey more difficult. This doesn’t need to be the case, religion could help those with mental health by teaching that religion doesn’t turn their back on those who are suffering but giving them the tools to find inner strength and seek help. Within the Asian community there are three main faiths, Islam, Sikhism, Hinduism. Throughout history and even still today relationships between the three religions can be strained at times but not in the world of mental health. There are support groups specifically aimed at those of each religious group but will openly encourage and support each other. When it comes to helping each other even though we may have different ways of practicing our faith it all comes down to one things, being a decent human being and helping each other out. No deserves to be alone. It’s not often that I get to cook with my mum, it’s always an opportunity to experiment with new recipes. This particular weekend we decided to make some homemade vegetable samosa’s with homemade pastry followed by some instant homemade jalebi. It was a completely indulgent weekend because both the samosa’s and the jalebi are fried so copious amounts of tea were drunk to help the delicious food to go down but then it’s the best way to eat this type of food. The samosa’s were more my mum’s idea I simply assisted. She had already boiled the potatoes before I arrived I simply had to make the filling. I had no recipe to hand so in my usual style I winged it, making it up as I went along tasting to see if there were enough spicies, salt etc. For the pastry my mum found this YouTube video, (please note it doesn’t have any sound) my mum watched it mostly for the technique the lady in the video used to make the samosa pastry. She rolled out the round discs and cooked them slightly on a flat pan! It sounds odd but the technique worked, you have to watch the video because the way I would describe the technique wouldn’t do it justice. This is a time consuming method and much easier when there are two of you making them or if you make them in bulk then freeze them but the end result is work it. The pastry when fried was light and crispy just how a samosa should be. My youngest sister is extremely fussy and even these won her seal of approval. Jalebi is one of my favourite Asian sweets, it’s sticky and very sweet. Using a piping bag or squeezy bottle a batter is piped/squeezed into hot oil in a swirly round pattern until a nice golden colour then soaked in a sugar syrup to give it’s sweet sticky taste and texture. It is because of it’s sweetness that I can only eat one of two at a time so thought a homemade version to suit my taste would be ideal. A normal jalebi batter is expected to sit overnight to allow so the jalebi once fried is light in the middle and crispy on the outside. I didn’t have the time or the patience to wait almost 24 hours for a jalebi batter to be ready, luckily I found this instant jalebi batter recipe from Tarla Dalal, you can add colouring to the batter if you want but I left mine au naturel. This was my first time making them so my piping technique needs some work but I did make some interesting shapes and patterns with the batter. This is how they are meant to look. This is how mine looked. The texture of the finished jalebi’s is slightly different to the overnight batter mixture but they taste just as good and quite addictive. They were sticky, crispy and the right amount of sweetness for my taste. I personally found they weren’t as crispy the following day but still nice to have with a cup of tea. This type of food it a treat, I couldn’t eat like this every weekend but it doesn’t hurt to be a bit indulgent now and then. Was having chicken kebabs for dinner this weekend and thought what would go nicely with it? Naan of course. Breads are not my forte but I was feeling brave so with the aid of Google I found this straightforward and easy to follow recipe on Allrecipes.co.uk. I did double and change the recipe slightly; instead of just plain flour I used half plain and half bread flour with an extra tablespoon of yoghurt. The extra yoghurt did create stickier dough; I just kept adding extra flour during the kneading process until I got the consistency I wanted. The dough need to be left for an hour to rise, I realised mid-way through this hour that I wasn’t going to be using the dough until the evening so put the dough in the fridge so slowly rise. By the time I came to getting the dough out of the fridge it was nearly at the top of the bowl. Knocked the dough back and let it sit on the counter for a bit before I made the individual naans. I cooked the naans on a tawa but a normal frying pan would work, though I am thinking of cooking them under the grill next time as then I can make a few in one go. I have to admit these turned out much better than I expected, soft, light and didn’t give you that bloated feeling. I did roll them out a lot thinner than your usual thick naans so they looked a bit more like puffed up roti’s but they tasted like a naan. As they were small and thin they cooked a lot quicker as you can tell I got distracted by something and this one nearly became charcoal. My family are usually my harshest critics, my sister said they were a bit chewy, not as good as our mums but nice, my mum and brother liked them, can’t please everyone! It could be that the naans were a day old when they tried them but I think my sister was just being difficult. If you have not ever made naans before then this recipe is one to start you off. Easy to follow and in my opinion they turned out tasting nice without leaving you with a bloated feeling afterwards. Yummy yummy, food in my tummy! I knew snow was heading my way again but hadn’t expected this weekend! Fortunately it was more like a dusting. The bitter wind was more of a shock to the system than the snow. Using a tablespoon dropped little portions into a pan of hot oil for deep frying until golden brown. You can experiment with finely sliced potatoes, fish, spinach, add a bit of lemon juice. Give it a go. I still went to my sisters, though a bit later than planned. Nephew #1 is quite the little baker. He likes to get in there with the mixing and the whisking. He did have to use both hands to hold the mixer whilst I poured in the eggs a bit at a time, the point is he did it and the beaters stayed in the bowl. He had wanted Power Ranger toppers but we didn’t have time to make to them. He was content with the icing and chocolate sprinkles. 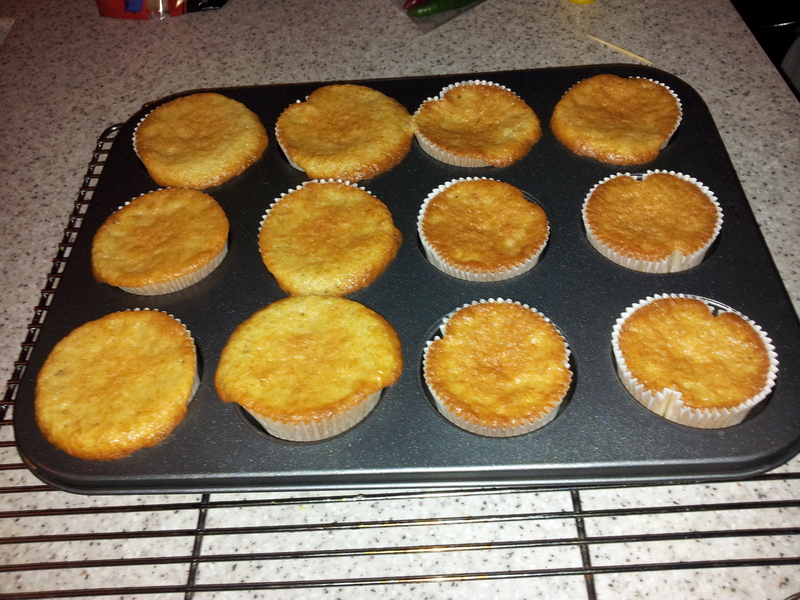 Here are nephew #1 vanilla cupcakes, not bad for a demonic 3 year old ;-). Sunday me and my youngest brother braved the elements and went into town. That afternoon me and brother setup up a blog for him to show case some of his art work, he’s posted his earlier drawings and drawings he’s done more recently so you can see how his skills have and continue to improve. 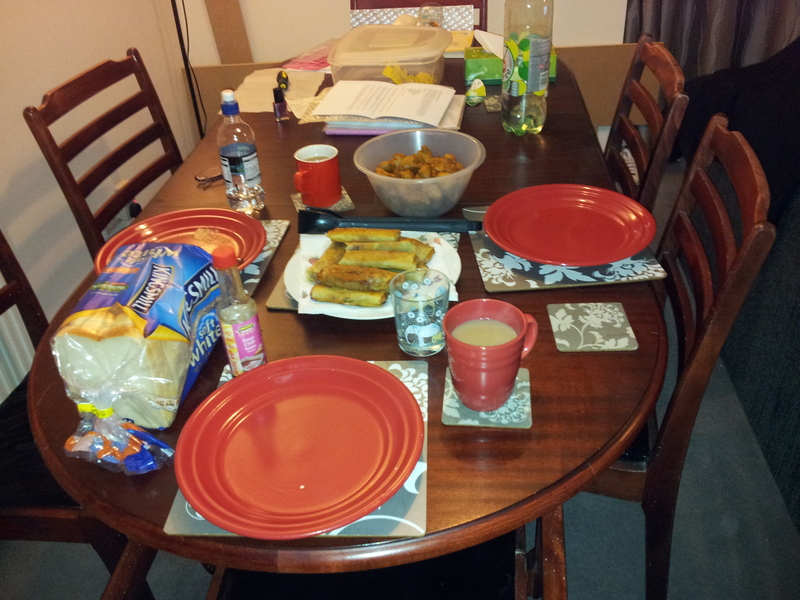 After setting up the initial stage of his blog I came home to my housemates preparing food for our evening feast. 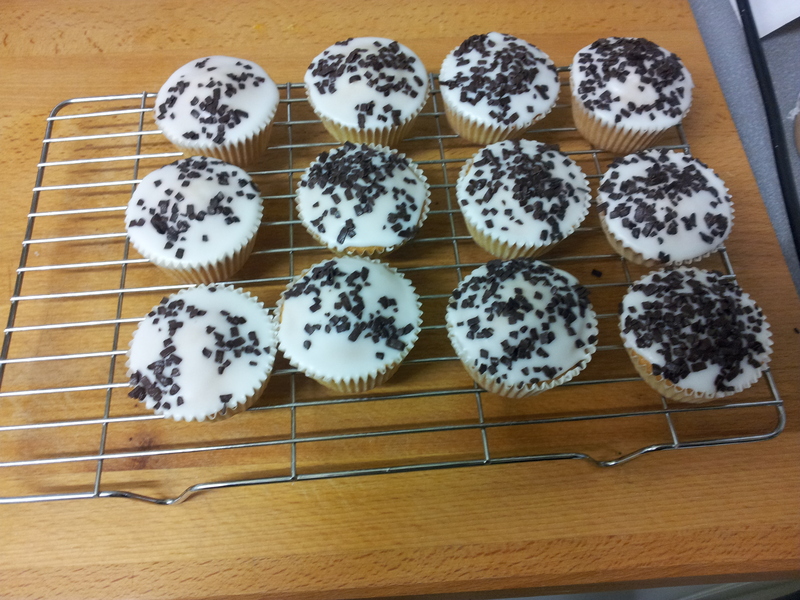 Before housemates started cooking I made some cakes. You’ve heard when tired you shouldn’t drive, operate heavy machinery…the same applies to baking! For some reason teaspoons of baking powder became tablespoon! To my horror it was too late to do anything but carry on. The cakes did grow and I used a knife to coax the cake off the cake tin where it had spread out. The cakes tasted ok at the time but crumbled when you peeled away the cake case. 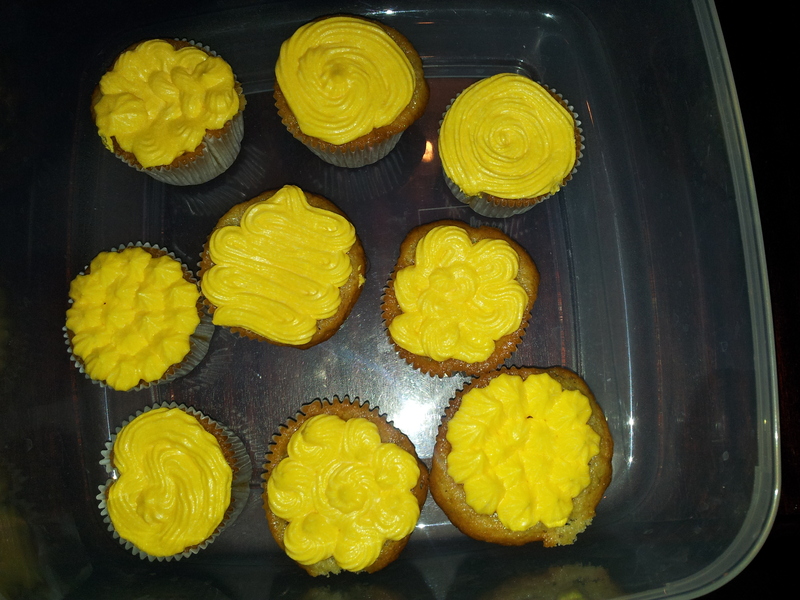 I wasn’t going to make any icing, but housemate wanted some…she just likes buttercream icing. I hadn’t taken any butter out of the fridge so used the stork stuff. Don’t ever use the stork stuff. Not only did the icing resemble a runny gloop that would not hold any kind of shape but also tasted awful. Both housemates have politely said when making the buttercream icing next time use butter. Back to the good food of the evening. Housemate #1 has given up meat for lent so made vegetable spring rolls. 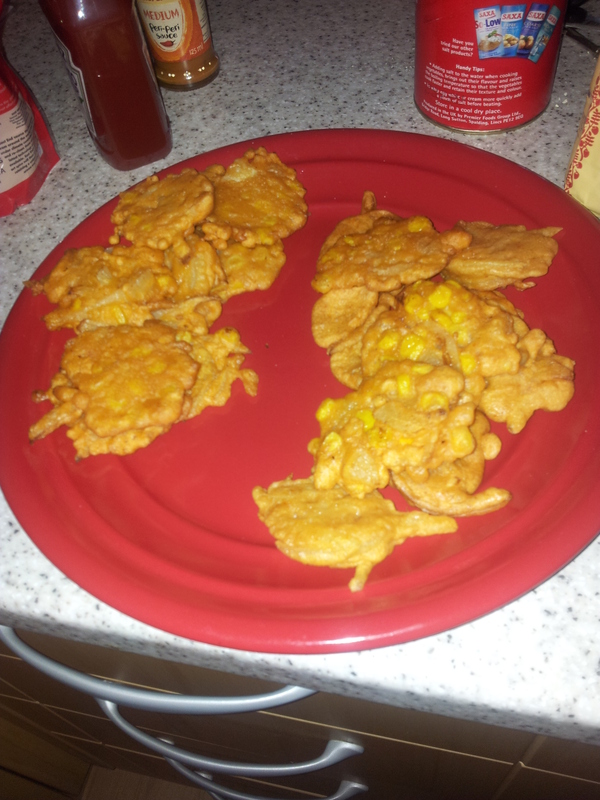 Housemate #2 make a Caribbean treat that resembled pakora called akra containing white fish and prawns. The recipe used by my housemate was given to her by her grandmother and different to the recipe attached. It was more to give an idea of what we ate. 🙂 Everything was fried. By the end of the evening we were all very full. I had even changed into trousers with an elasticated waistband, but even they had been stretched to the limit. We all had work the next day but were so full up we couldn’t move to go up to bed. Needless to say we all got up late for work.